ex) Can I get a bulkhead seat or an extra legroom seat? 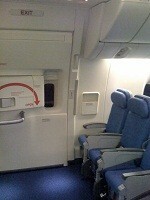 ex) Tray tables for bulkhead seats are stored in the seat's armrest. bulkhead: A bulkhead is an upright wall within the hull of a ship or within the fuselage of an aeroplane. Other kinds of partition elements within a ship are decks and deckheads.